Splurge on a high-performance wireless router. If the high cost of a performance-oriented wireless router has stopped you from upgrading, we have good news. In celebration of this year's Game Developers Conference (GDC), Amazon is offering a 20 percent off coupon code that is good on select networking equipment. Use coupon code GDC20 to save 20 percent. The offer applies to products sold and shipped by Amazon and is valid until 11:59 PM (PT) March 10, 2017. More terms and conditions can be found here. There are several deals to be had with the coupon code. 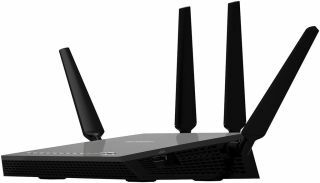 One of them is Netgear's Nighthawk X4 AC2350 router. The 4x4 MU-MIMO dual-band router is on sale for $170, and that's before the 20 percent discount. It offers up to 600Mbps on the 2.4GHz band and up to 1,733Mbps on the 5GHz band, supports open-source firmware, and has two USB 3.0 ports and a single eSATA port for connecting external devices. Another good deal is TP-Link's AC3150 router. It's priced at $150 before discount and offers up to 1000Mbps on the 2.4GHz band and 2,167 on the 5GHz band. For what it's worth, this is one of Amazon's top picks.